In a class with one of our Business English students, we suggested a way to deal with a co-worker who uses complex and unnecessary language compared to other colleagues when communicating in English in conference calls. The student feels stressed and gets blocked because they need to be able to take notes, respond to key points and defend their views in conference calls with this co-worker in English. 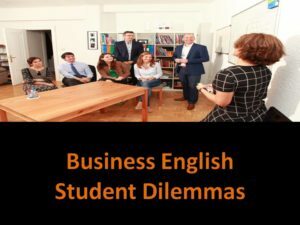 The student doesn’t have a problem understanding other co-workers in conference calls in English, but started to question both their abilities and English. Exercise 1 – we suggested to the student that they analyse and compare the communication styles and English used by that co-worker with the other co-workers in the weekly conference calls they have. The goal of the exercise was so the student identified the key differences (English used & communication styles) in these specific tasks between that co-worker and the other co-workers. Exercise 2 – we also asked the student to ask their other co-workers if they had problems understanding the communication of that co-worker in conference calls? And their answers helped show the student that their abilities and English were not the problem. The student now feels more confident and no longer doubts their abilities or English. The student also realised that they needed to use more active listening techniques with this co-worker (e.g. check information, clarify their understanding, listen really carefully, give feedback and paraphrase in their own words what was said).